The interview is also available in Dutch and French. The English translation of the interview answers was done by Leex; the Dutch translation by Degtyarov. 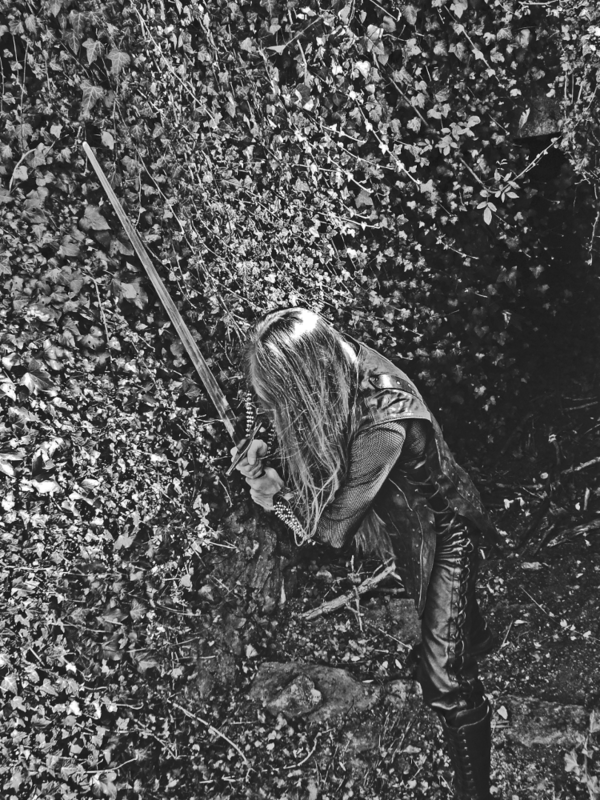 Those who delve into the more obscure regions of French black metal, are bound to uncover veins of black gold, which have been there for an eternity, hidden from a world that cannot handle them. Sometimes, this path of solitude is chosen consciously, and the bands in question wish to remain anonymous, unknown to the dwellers of the world of light. Les Légions Noires feared exposure in the same way that many feared their music. A testament of authenticity to some, a desperate gimmick to others, the fact remains that the eagerness of a large audience did not tempt the members of the Légions to step into the spotlight – perhaps because they knew their obscurity was the foundation of their very existence. At other times, obscurity may derive not from a careful cultivation of a myth, but rather from factors such as a lack of promotion, sporadic activity, or even sheer coincidence. In layman’s terms, some bands remain unknown to larger crowds simply because they do not spend every waking hour promoting themselves, or – even more mundanely – because their line-up does not sport any prolific (in the sense of famous) musicians. 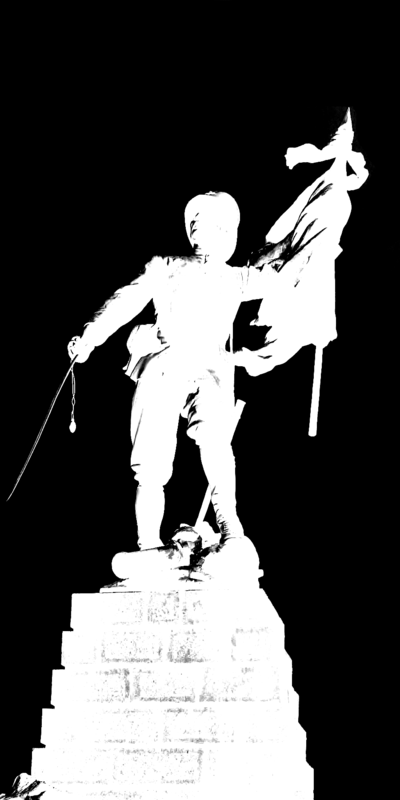 From the historically rich Auvergne region, in France, hails one such band, whose lack of recognition thus far is a complaint against good taste. 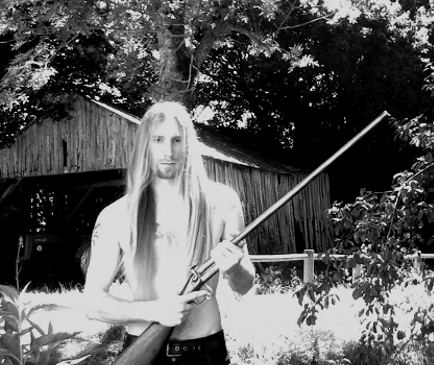 This force of desecration is known as Sühnopfer, the black metal project of multi-instrumentalist and sole member Ardraos. Formed in 2000, Sühnopfer has built up a quantatively modest discography of three demos, an EP and one full-length album. With the latter two releases easily ranking among the best that the French black metal scene has had to offer thus far, it remains somewhat of a mystery as to why people who have as much as heard of Sühnopfer are, at least outside of France, even harder to find than the band’s demos. However, now that Ardraos has joined the ranks of Kommando Peste Noire, handling the drums on these hooligans’ latest album, Sühnopfer‘s dramatic riffs, haunting mediaeval atmospheres and virtuosic drums may finally reach the ears of the broader audience it deserves. And with a new full-length album, titled Offertoire, scheduled for a quick release, there is really no excuse to ignore this band any longer. In anticipation of the follow-up to the 2010 debut album Nos sombres chapelles, I sat down with the mastermind behind it all, Ardraos, and talked with him about his projects, the upcoming Sühnopfer album, and French culture. Degtyarov: Let us start by clarifying the concept and history of Sühnopfer, for those who may not be familiar with the band. What were the circumstances of its founding and how has the band’s concept developed over the years? Ardraos: Hail! Let’s start with a little retrospective then. I created Sühnopfer in 2000 when I was about 15 years old. Back then, I played drums in local black metal bands and thus grew more and more interested in all other instruments so as to compose my own music. As a matter of fact, I’ve always written and played the whole of Sühnopfer‘s songs. Of course, it wasn’t grand in the beginning. I first had to master the instruments on the one hand and compose songs on the other. My first demo-tape, The Eternal Sacrifice (2001), was a sort of compilation of tracks I had sporadically recorded on my 4-Track cassette recorder. The lyrical themes were quite commonplace: when you’re 15 and get started in black metal, you’re obviously influenced by the bands you listen to, and at this time of your life, whether you’re aware of it or not, you always want to belong to this milieu and reproduce some models: purely anti-religious feelings that remained undeveloped. Then I released two other demos Shades of Thy Beauty in 2003 and Laments in 2004. During these first years, my music changed into a more melodic and most of all a more personal sort of black metal. People from the French underground black metal scene discovered me thanks to Laments, and this demo has recently been mentioned in Anthologie du black metal, written by my friend Guudrath, and published by Camion Blanc. However, I think that the real watershed for Sühnopfer was the recording of my first EP by a label (Eisiger Mond) L’Aube des Trépassés in 2007. At this time of my life, I was getting more and more interested in the Middle Ages and the relics of this period in my region (Auvergne – ed.). My abilities to write and play music had also developed. On top of that, I was starving for solitude and contemplation. 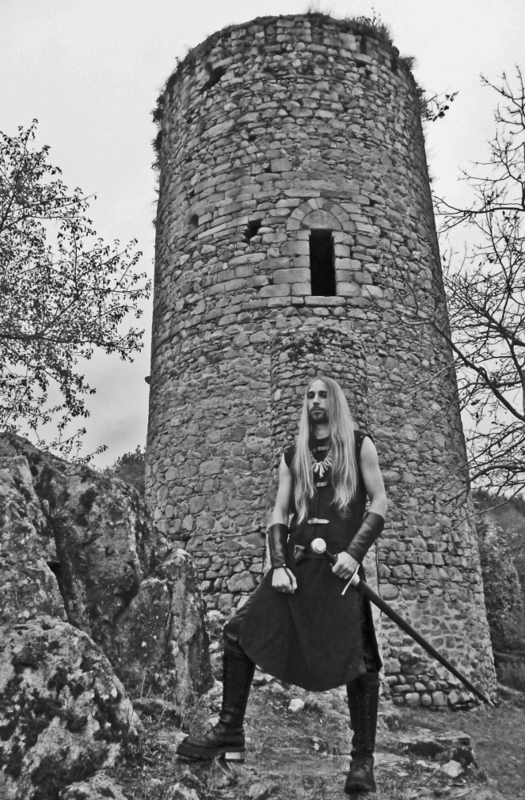 The EP was more widely distributed, got positive opinions, and was therefore a breakthrough in the French black metal landscape. And that guy from Horna even offered to produce a cassette-release of this EP. I didn’t expect anything like this when I got started. I nevertheless stuck to the same objective: most of all, creating music that I like, and for my own pleasure: this makes the albums authentic. Nothing surprising came after that… L’Aube des Trépassés still had some small defects, and Sühnopfer‘s real first album was released in 2010 by Those Opposed Records after 10 years. Nos Sombres Chapelles could show how my technique as a musician and my songwriting had evolved. It was a real musical and personal accomplishment. I also developed themes that I had started dealing with in the previous EP so as to fit into a medieval, knightly, obscurantist and religious dimension, by adding aspects of my “terroir”, typical of my homeland. Even nowadays, this land still shows how powerful, glorious and dark it was. D: Sühnopfer may not have accrued the same amount of fame as some other French BM bands, but how has the reception to your music been over the years? Do you have a lot of foreign fans, for example? A: Sühnopfer was first distributed in France and has been known abroad since 2007, thanks to labels. However, so far I’ve only issued one full album (there’ll soon be a second one) and an EP. That’s why, although more foreigners have come across Sühnopfer (on the internet or through labels), I’m still better known in France than abroad. To conclude, I could say that Sühnopfer‘s fame is growing thanks to my involvement in other bands, and I hope it will become stronger after the next album. 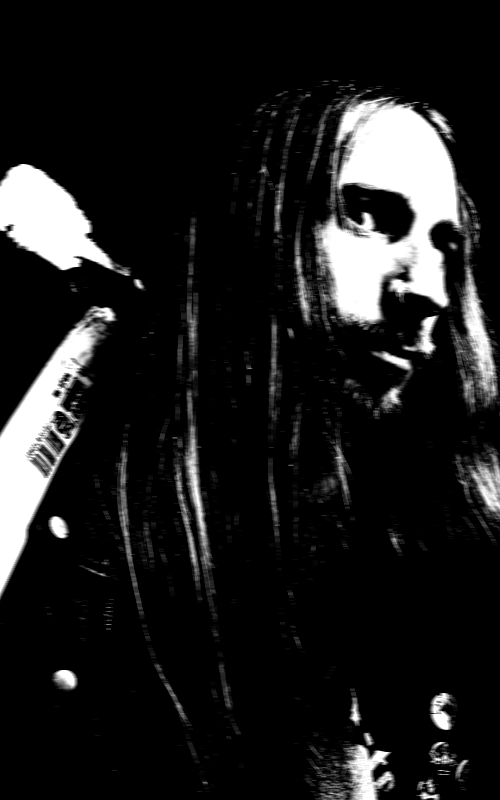 D: Fenriz has repeatedly stated that, while he is often viewed as ‘the drummer of Darkthrone’, he actually has more affinity with the bass guitar. And even though you are a well-established multi-instrumentalist yourself, I still think of you as a drummer; not even because you play this instrument in Peste Noire, Christicide and a plethora of other bands, but because the drums are so prominently featured in your work with Sühnopfer. 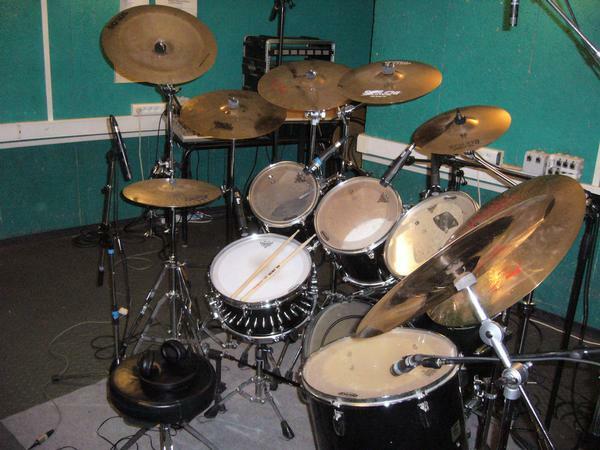 So, do you ‘feel’ a drummer, or do you secretly cherish love for another instrument? A: Even if I started music at the age of 6 by learning how to play the accordion, I’ve always felt more drawn to drums. (I started practising drums when I was 14, at last…) I only came to play other instruments afterwards… I see myself first and foremost as a drummer. I obviously like practising the guitar and the bass while composing for Sühnopfer, but truly drums rule all my activities linked to music. D: They really do, because when I first listened to Nos sombres chapelles – the title track primarily – the music sounded as if the drum patterns had been written first, and the guitar riffs came later. While I don’t know if things work like that, is there any truth in the idea that the compositions and structures of Sühnopfer’s music are considerably more drum-based than your usual black metal band? A: It may sound as if drums were composed first, but they weren’t. I always start creating Sühnopfer‘s songs by composing guitar riffs. Once these have been put together and arranged, (most of the time three harmonized different guitar melodies), I look into drum-patterns on which I spend quite a lot of time so they really match the riffs and show some expertise. Then I really give my best to record drums because that’s my favourite instrument. What you heard is just the way I play drums, I don’t know how to explain this impression that drum patterns were composed first… Maybe because drums were mixed louder than in other “normal” bands: as a drummer, I certainly tend to highlight drums. Anyway, I’d really like people to focus on guitar parts as well since it’s what takes most of my time and because in my opinion, they represent the soul of Sühnopfer‘s tracks. D: Sühnopfer, as a band, seems very tied to the specific history of the region it hails from – Auvergne. You even have the Auvergnat emblem tattooed on your back. I know that, in Spain, for example, it would be difficult to identify with Catalonia or Galicia without at least awakening the suspicion of some politically sensitive context. Does this kind of regional affinity carry any connotations of regionalism/separatism in France? And if yes, does this reflect on your music at all? 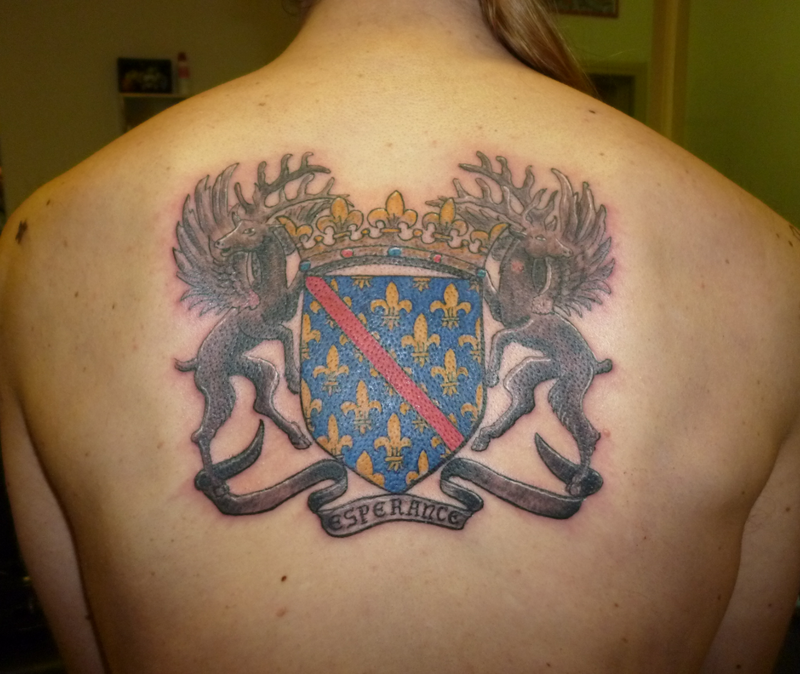 A: First, I feel attached to Bourbonnais (whose coat of arms is inked in my back): it is the ancient province which belonged to the Dukes of Bourbon and it roughly corresponds to the département of Allier, and is now a part of Auvergne (administratively speaking). I was born in Bourbonnais, and so were my ancestors, amidst its wooded countryside, forests and ruins… Then, because of my studies and my job, I had to go to Auvergne, around Clermont, Riom, and now I live in the countryside, in Southern Bourbonnais (or Northern Auvergne). It allowed me to discover a large part of the region. You’ll always find people who’ll say Auvergne is backwards. It’s true the weather is tough, there’s a lot of empty land and scattered, remote hamlets… but that’s what shapes and toughens real characters, not gentrified fags. More generally speaking, I think there’s everything you need to live peacefully here. We’ve got many different landscapes, villages, relics and natural sites. I also try to draw the energy which will liven up my music on this atmosphere. However, I’ve seldom mentioned my region in my lyrics so far (in two songs only : “Brûme sur le Châstel” and “Espérance”). My next album includes some tracks based on local legends linked to specific locations (for example the château de l’Ours in Allier, where my latest pictures were taken). I’m most of all fond of using pictures, monuments and landscapes provided by our local heritage, its charm and atmosphere. I just think it fits the themes I’m led to deal with. I may be attached to my roots, but Sühnopfer is not a regionalist band politically speaking, but the slightest symbol or reference to some land in a piece of artwork can lead a band to being labelled as regionalist. As far as regionalism is concerned, it’s become quite popular all over France in recent years, but sometimes tends to become only venal… Throughout the history of France, and more particularly in the last centuries, local differences and dialects have disappeared little by little in order to make a unified territory out of our country. There’s always been a separatist lean in Corsica, for example (which is easy to understand, regarding the historical and geographical particularities of this island), but not in other French regions, even if some claim their own identity (like Brittany or Alsace). Yet the French administrative structure is different from what exists in Spain or Germany, where regions are more independent. You need to know that in France, our “régions administratives” have existed only since the 1980s, and are based unified “départements”, smaller and older administrative units (sorry for this lecture on French domestic policy). There’s quite a paradox in France: if you say “I love my region”, that’s alright, it’s part of folklore. But when you say “I love my country”, it’s considered as a racist statement… Go figure. Well, if you want to get back to an identity more deeply rooted in your region, it’s a good thing on a cultural level, an improvement, and most of all a counterweight to the way most of the rootless and uncultivated young people living in France behave. D: Expanding some more on the cultural aspect: one peculiar detail about Sühnopfer is that the first few demos were in English, but that with L’aube des trépassés, you switched to French. Usually we see this happen the other way around. Bands like Enslaved switched to English to appeal to a larger audience (even though they hilariously deny this), but it consequently seems hard to believe that you switched to French to appeal to, uhm, a smaller audience. Is there any particular reason for the switch from English back to French? A: That’s right, my lyrics used to be in English on the three demos, except a track in French on Laments. I began using French with L’Aube des Trépassés simply because I couldn’t wholeheartedly and fully express the feelings I wanted to convey in English: my vocabulary is quite limited in this language. Besides, the lyrical themes allowed me to add words and expressions in Old French (it enhanced my songs and gave them a darker side as well). For instance, in “Vous, ou la Mort”, which is about forgotten medieval traditions, I use some words that disappeared from the French language, but they needed to be used because they really stick to the topic I was dealing with. I’m not going to start writing all my lyrics in Old French; it would be too difficult to grasp, both for me and the reader. In my opinion, the French language allows this mix of old-fashioned words, when the lyrical themes are presented in their context. What matters to me while writing the lyrics is looking for themes and historical details, and the atmosphere that’s going to match the music. Mastering the modern French language perfectly is quite an achievement for many people if you consider how it’s botched up in everyday life… I used to be a teacher a few years ago and I can tell you that 80% of French students can’t write a text without making grammar or spelling mistakes. On the other hand, when I was a student myself, the teachers would kick our asses if we made a little mistake. Being so lenient has just become normal over the years, and nobody seems to care… It’s a real cultural disaster. D: Still, in general, it seems as if French black metal bands these days are much more inclined to sing in their native tongue than bands from, say, Scandinavia or Holland. Do you share this perception, and do you have a possible explanation? A: I never paid much attention to the languages used by other French bands. I think that if a lot of them (including Sühnopfer) write their lyrics in French, it’s just because as you said it, they naturally use their native tongue, or because they realized how rich a language it is, or because using it is of paramount importance for our heritage. Somehow, France is a bit behind with speaking foreign languages, and I’m the living proof. In some countries of Northern Europe, people will speak English almost as fluently as their mother tongue, and in France we’re far from it… But it doesn’t really matter which language those bands use as far as they are honest and original; that’s what is important to me. Yet, if a band uses bad English and clichés, it won’t deserve any attention. D: About a year ago, it was announced that you would be performing on the new Peste Noire album, acting as the band’s drummer. 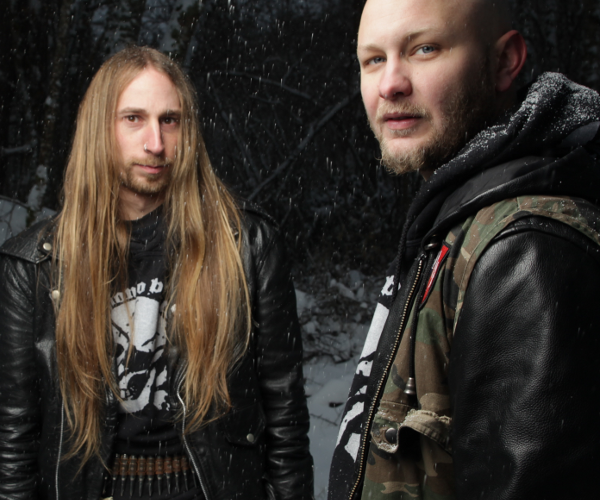 How did you end up in the ranks of what may just be France’s most infamous metal band? 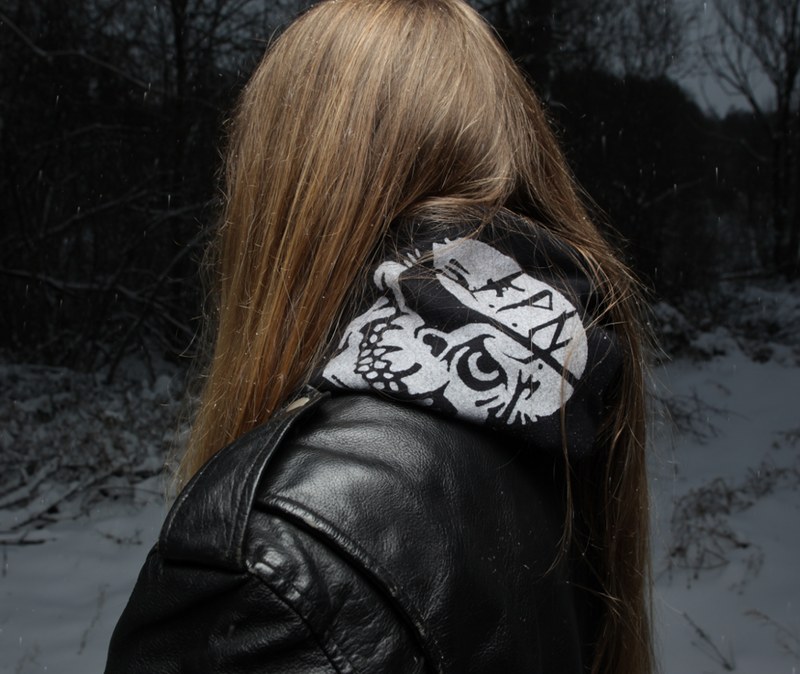 A: I had already met Famine several times during concerts (we opened for Peste Noire in Lyon with Sigillum Diabolicum in 2007), especially Aorlhac‘s gigs (Famine likes their music). I had given him a copy of Nos Sombres Chapelles, which he must have enjoyed, since in August 2012, he contacted me because he was looking for someone to record drums on his new album and we didn’t take long to reach an agreement. The fact that he moved in Auvergne in the meantime certainly carried weight. If you want to know more about this, read Famine’s interview “KPN V“. D: Peste Noire’s self-titled album has been out for a while now, and one could say the dust has settled. How has the K.P.N. adventure been for you, so far? Did you get a lot of responses on your performance, either from listeners or other bands interested in hiring your services? A: I recorded drums quite quickly (about a day and a half); I also played the accordion a little on a track (I hadn’t touched that instrument for many years). We also had an extraordinary weekend with Valnoir from Metastazis for the album photographs and I was very satisfied to be credited on this album, almost as a duo with Famine. What really mattered was being satisfied with the result. Since we recorded quickly and sometimes in an improvised way, or keeping to what Famine wanted and the way we recorded it may explain why drums are not as spectacular as what I do with Sühnopfer or Christicide, for example, but you also need to adapt the way you play to the characteristics of a band. People have more than often asked me to play in their bands before drumming for KPN: since I’ve worked in Sühnopfer, Christicide and Aorlhac, a lot of people discovered the way I play drums, on albums or on stage. Every year, I have to refuse a couple of requests from bands looking for a studio or concert drummer because of my busy schedule. D: Staying on the topic of Peste Noire for just a little bit longer, the fact that it is the project of Famine and Famine only has been established well over the years. The other band members have often been referred to as mere session members who contributed their technical skills to the band, but nothing more. Still, I get the impression – and do correct me if I’m wrong – that you have come closer to being a full-fledged band member than the likes of Andy Julia and Neige, whose tasks were very limited. So tell me, are you, as the band’s drummer and accordionist, a mere mercenary in Kommando Peste Noire, or one of its genuine légionnaires? A: It is true that Famine created the concept of Peste Noire and has always composed the music since the very beginning. The band released 4 albums before I joined them. At first, I thought I had been called for back-up for the recording of the latest album only but then we quickly came to talking about gigs we could plan (some of my close friends may join the line-up for these concerts). As I told you, Famine’s moving to Auvergne certainly made things easier: we see each other on a regular basis (he even rewarded me with a vocal participation on Sühnopfer‘s latest album) and even if we have different personalities, we do share some ideas. Of course I hope this collaboration will continue and make KPN‘s stature increase even more. D: The year 2013 must have been very busy for you: not only was the new Peste Noire album released, but also Christicide’s latest effort, Upheaval of the Soul. Could you tell us a bit more about your role in that band? Are you involved in the composition process, for example? A: To begin with, Christicide‘s latest album was recorded at the end of 2011, but it was released quite a long time later because mastering, artwork and pressing required a certain amount of time. I’ve played drums in this band since 2008, just after they issued their first album. Afterwards, we released a split EP with Cantus Bestiae and a very underground live tape, but most of all we performed on stage quite often before the first album was released. Scars really is the brains of the band: he composes by playing the guitar (yet the other members have their say) and writes the lyrics. I can obviously develop the drum parts as I wish. Since we don’t live near one another, we don’t rehearse very often, usually the day before a gig, or to start the composing process. D: Later in this busy year, we will finally see the release of Sühnopfer’s new album. I can imagine that recording a CD all on your own is a very demanding and drawn-out process. So, how long have you been working on it, and when can we expect it to be released? A: As I’m writing these words, I still haven’t got a precise release date. I’m going to mix everything these days; I’m still waiting for vocals a friend of mine did, and everything will be ready. NKS from Aorlhac recorded the album and is about to master it. After that, you’ll need to wait a little more for the pressing… It varies, but it can sometimes take a lot of time (especially when you have your CDs pressed in the Czech Republic – ed.). As regards composing, it is a long process. First it depends on the time it takes me to find the riffs (you need inspiration for that) and assemble them so as to create whole tracks. Then I need to make extra guitar parts which will come in addition to the basic riffs, in order to get the most important elements of the track and then start thinking about the drum parts. After that, I do my first demo with my old 4-track tape recorder, so as to assemble guitars and drums. I usually reach that stage after a year. Then I can start thinking about lyrics, working on drums and guitar arrangements more thoroughly, all of that before I start recording the album. I work on the bass only after guitars and drums were recorded in studio and I finally record vocals. For instance, I finished composing my new album in late 2011, I started recording in June 2012 and finished a year later in June 2013. It takes a long time partly because I don’t have the means or the knowledge to record everything myself, so I ask friends to act as sound engineers and their schedules can be quite busy too. D: Sühnopfer has always been about mediaeval atmosphere, delivered through fast, technically sublime black metal. In this sense, it’s quite distinct from a lot of French black metal: it’s not as ‘out there’ as Peste Noire, nor as emotional as the likes of Mortifera. One could say Sühnopfer has a largely Scandinavian style that dips heavily into French atmosphere. Will the new album be a continuation of this concept, or did your recent affiliation with some more experimental projects perhaps encourage you to handle things differently? In any case, I do hope you will keep singing in French! A: First of all, don’t worry, I’ll sing in French only! As I’ve just said, the tracks have been ready for nearly 2 years, so I won’t try anything risky just because I’ve been involved with other bands. You’ll probably notice an evolution in the way I play and sing, though, but only a natural one. I hope I’ll get a more intense and striking result than Nos Sombres Chapelles; the sound will always evolve, generally speaking, but I’ll keep the same guiding line: still the same medieval and knightly atmosphere, yet darkened and hardened on some passages. This new album is to be called Offertoire, it will include 7 tracks and will last about 50 minutes; two songs deal with more religious themes while the others tackle locations and legends from Bourbonnais, but still in a medieval context. You’ll notice again this “Scandinavian” aspect, since as you know it, I’m rather influenced by Sacramentum (Far Away from the Sun), Dissection and Setherial (Nörd); however you’re right when you say these influences were taken up by the personal and local facet of my music. I’ll let you appraise this new album, and we’ll see if you agree, but I think there’s no other French band making black metal similar to Sühnopfer. I hope that for all these years I’ve set up a project with its own personality. D: You are slowly growing into a French Hellhammer, judging by the amount of bands you’re involved in. Are there any projects, apart from the ones mentioned in this interview, that we should look out for? A: Thank you for such a comparison, but I don’t think I’ve reached such a status. Apart from Sühnopfer, Christicide and Peste Noire, we’ve mentioned Aorlhac, who have issued two good albums and for whom I played drums on stage, but I’m about to record drums for their new album, this time. I also sang at Sigillum Diabolicum‘s concerts; they released albums on which I didn’t take any part either. I’ve just recorded drums in a studio for Lemovice, a French Oï band. And I think that’s about it. D: Similarly, are there any bands in the French scene in general that deserve a bit more attention/recognition abroad? A: As I’m really busy with my own job, I haven’t got enough time to follow new releases, both from the French underground scenes of from important Scandinavian bands. Yet, I sometimes get to like some groups I discover at gigs or thanks to friends. I’m thinking about early work by Darkenhöld, or in a different category, my friends from An Norvys who play celtic/folk metal. D: Alas, we are nearing this interview’s conclusion. For those readers who were not arrested for legally purchasing fire-arms, do you have any advice or other closing comments? A: Haha, I could have got arrested myself! Well, to conclude, when the new album is released on Those Opposed Records, Laments and L’Aube des Trépassés should be released again, but this time on one CD only, since both are almost sold out. Nos Sombres Chapelles has just gone out as well, but I’m currently discussing with German label Deviant Records the possibility of an LP release. The new album may be issued as a vinyl edition too on Those Opposed Records. Small French label The Way of Force, has released a tape version of Nos Sombres Chapelles and shall do the same with the new album. They’re about to issue a compilation tape entitled Morbid Tunes of the Black Angels: it will include a track by Sühnopfer and many other talented French bands like Christicide. There you go, thank you for this interview, and I want to thank all those who have supported Sühnopfer or other bands I play with. I hope you won’t be disappointed by my new album. Keep up the good work you’ve done with your fine analyses! And that concludes our interview. BIT’s first, mind. On behalf of myself and the other editors, I thank Ardraos, for spending some of his valuable time to answer these questions. That our paths may cross again!